A 1958 Porsche 550A Spyder is the lead car for the Mecum Monterey 2018 collector car auction but modern hypercars are also attracting much attention. Although a 1955 Porsche 550A Spyder, estimate $4,500,000 to $5,000,000, is the most-expensive car on offer at the Mecum Monterey 2018 collector car auctions, around 20 mostly modern hypercars are also expect to achieve results above a million dollar. These cars include a Ferrari F50, an Enzo, two LaFerraris and two F12tdfs, three Bugatti Veyrons, a Lamborghini Centenario, a Reventon, a Pagani Huayra, a McLaren P1 and a Porsche 918 Spyder. Mecum is also offering (again) the only current series pre-owned Ford GT at public auction. Mecum’s annual event on the Monterey Peninsula takes place August 23-25, 2018, at the Hyatt Regency Monterey Hotel and Spa on Del Monte Golf Course. 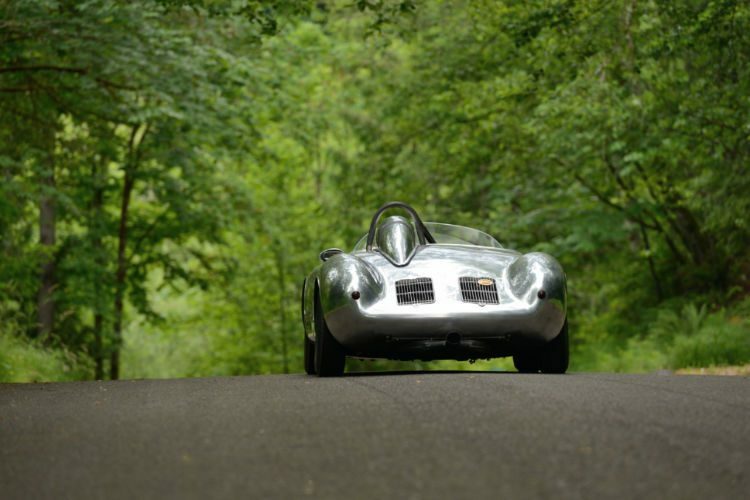 Mecum usually offers around 600 cars during the Monterey Week sale that include the popular The Daytime Auction where the Porsche 550A is currently scheduled to head the auction block. 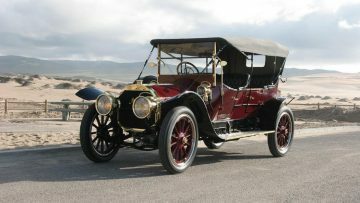 Four of the top cars on offer at Mecum Monterey 2018 are typical classic cars that are more commonly expected at Mecum’s competitors such as RM Sotheby’s, Gooding and Bonhams (and true to form, similar cars will also be on offer at the sales of these auction houses during the same week). The 1958 Porsche 550A Spyder, chassis 0141, estimate $4,500,000 to $5,000,000, is the most-expensive car on offer at the Mecum Monterey 2018 collector car auction. (Gooding and RM Sotheby’s have similar Porsches on offer). This 550A Spyder is one of only 39 produced and was successfully raced to victories in period in races in Austria and Yugoslavia. It subsequently raced in the USA too. 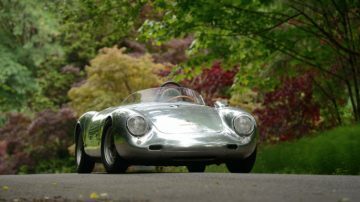 See 1958 Porsche 550A Spyder Announcement for more on this car. The fire engine red over tan 1955 Mercedes-Benz 300 SL Gullwing is one of five Gullwings available at the various Monterey Week 2018 auctions. This European-specifications Gullwing is a matching-numbers car with only 30,534 miles on the clock. 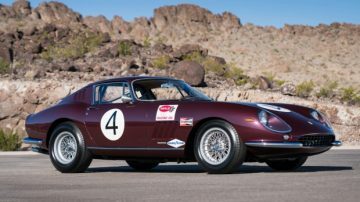 The 1967 Ferrari 275 GTB/4 Berlinetta, chassis 10717, is somewhat surprisingly the only standard 275 GTB on offer at the Monterey 2018 auctions. Prices for this model have been weaker at recent auctions and the rather bold estimate is partly attributable to the car having covered less than 15,000 km since new. The 1965 Shelby 289 Cobra, chassis CSX2588, on offer at Mecum was the penultimate 289 Cobra produced and the last one sold outside the Shelby family. The 2017 Ford GT is certainly not the most-expensive car on offer at the Mecum auction but one that is attracting a lot of attention. Ford produced only 250 of this GT series and owners were not supposed to be able to sell the vehicle on within two years. 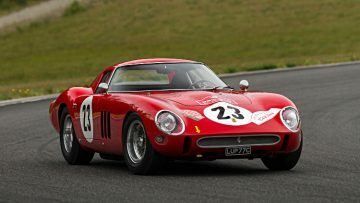 However, this GT – the 48th one produced – was sold be its first owner and subsequently sold by the second owner at the Mecum Indianapolis auction for $1,815,000. It has only 8 miles on the clock and it is expected that many other Ford GTs are similarly hogging garage space by owners wary of selling it within in the 24 month period. The only other 2017 Ford GT sold at auction was with Ford’s involvement in a charity lot. It achieved $2,500,000 at Barrett-Jackson’s Scottsdale 2018 sale. Several modern Ferraris with estimates above a million dollar are on offer at the Mecum Monterey 2018 sale. The 1995 Ferrari F50 was the second of the 349 built and was displayed at the Frankfurt Auto Show. It has covered only 3,363 miles since new. It is the only F50 available at Monterey Week 2018. Mecum similarly has the only Enzo available at Monterey 2018. This 2003 Ferrari Enzo similarly has a relatively low 3,150 miles on the clock. Two of the four LaFerraris available at Monterey 2018 are at Mecum: a yellow 2015 Ferrari LaFerrari with 419 miles on the clock and a red 2014 Ferrari LaFerrari with only 307 miles on the clock. Several F12 Tour de France cars will on offer but only Mecum has the confidence of million-dollar estimates for the two 2017 Ferrari F12 TdF cars on offer: an anthracite model with 446 miles on the clock and a red one with 1,175 miles. Mecum will offer several expensive Lamborghinis at Monterey 2018 led by a 2017 Lamborghini Centenario LP770-4. This is one of only 20 Centenario Coupes produced and the only example in nero with red trim for the US market. It has covered only 49 miles since new. The 2008 Lamborghini Reventon is similarly as new with only 168 miles on the clock. This was the last of only 20 Reventons produced. The 1969 Lamborghini Miura P400 S was the second Miura P400S produced and considered the earliest know existing Miura S. It is unrestored and retained its original paint, interior and even tires. It has 46,045 km on the clock. Three of the five Bugatti Veyrons on offer at the Monterey 2018 auctions are at Mecum with Bonhams having the only Chiron. The silver 2015 Bugatti Veyron Grand Sport Vitesse Roadster was the 74th of 150 produced and has only 1,526 miles on the clock. The red and black 2012 Bugatti Veyron Grand Sport 16.4 was the 9th of 11 produced for the US market. It has only 850 miles on the clock. The black 2010 Bugatti Veyron Sang Noir is one of 12 Sang Noir editions built and the only one with a red interior. It has 3,401 miles on the clock. The 2014 Pagani Huayra was the 62nd of 100 produced. Although it has only 439 mile on the clock, the estimate is well above any result for this model with the reserve presumably also relatively high. The 2015 McLaren P1 – the 330rd of 375 produced – has only 535 miles on the clock. It was a MClaren Special Operations option that cost $114,327. The estimate is in line with recent results for this model hinting at an owner keen to sell. The 2015 Porsche 918 Spyder was the 541st of 918 built. It has 855 miles on the clock and has the highest estimate of the three 918s on offer at Monterey. Somewhat surprisingly the 1987 Porsche 959 Komfort, estimate $450,000 – $550,000, is the only 959 on offer at any Monterey 2018 auction. The low estimate? The Porsche has an unrepaired front-end crash – inspect in person before bidding. Unfortunately, Mecum will not have a Porsche Carrera GT on offer this year. The previous three years in a row, Mecum sold a Carrera GT for over a million dollar at the Mecum auction. A result never achieved by any other auctioneer.